Description: This woody shrub is usually 1-3' tall, although sometimes it becomes up to 6' tall. This shrub produces abundant branches that are widely spreading to erect. Alternate individual leaves, or alternate clusters of leaves, occur at intervals along these branches. 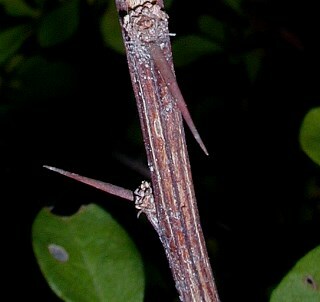 There is often a solitary thorn underneath each leaf or cluster of leaves; these thorns persist after the leaves fall from the branches. Twigs and young branches are brown, angular, and ridged. Older branches are striped with different shades of brown, while the oldest branches of large shrubs have rough grey bark. Individual leaves are are up to 1¼" long and about 1/3 as much across; they are oblanceolate to obovate, smooth along their margins, and hairless. The upper surfaces of the leaves are medium to dark green, while their lower surfaces are light to medium green. About 1-5 flowers develop from the axils of the leaves or clusters of leaves; these flowers are arranged in drooping umbels that develop from short stalks (peduncles). Individual flowers span about ¼" across, consisting of 6 petal-like sepals, 6 petals, 6 stamens, and a single pistil. Both the petals and sepals are pale yellow; the sepals are widely spreading, while the petals form an inner cup that surrounds the reproductive organs of each flower. The blooming period occurs from mid- to late spring. Fertile flowers are replaced by ovoid berries containing a few seeds; these berries are bright red at maturity, about 1/3" (8 mm.) in length, and they have a rather dry mealy texture. The root system is woody and branching. If the tips of branches become lodged in moist soil, vegetative offsets can develop. Otherwise, Japanese Barberry spreads to new areas from the seeds in its fruit. Sometimes, this shrub forms thorny colonies. Cultivation: This shrub adapts to a wide range of conditions. It can be found in full sun to medium shade, moist to dry conditions, and different soil types. The seeds have a high germination rate. Unlike other Berberis spp. (Barberries) that have naturalized in Illinois, Japanese Barberry is resistant to wheat-stem rust. Range & Habitat: Japanese Barberry is occasional throughout Illinois; it is more common in central and northern Illinois than in the southern section of the state (see Distribution Map). Populations of this shrub within the state are probably increasing. It was introduced into North America from Japan as an ornamental shrub. In the United States, various cultivars are available for gardens and landscaping, even though this shrub is invasive in some areas. However, cultivars with yellow to red leaves are less vigorous and they don't appear to escape into natural areas to the same extent as green-leaved cultivars. Habitats of escaped shrubs include open woodlands, woodland openings, woodland borders, thickets, savannas, meadows, pastures, and roadsides. Usually this shrub is found in mesic to dry areas that are open to semi-open, although it also occurs in moist shady woodlands. Faunal Associations: The flowers attract small insects with nectar and pollen; such visitors trigger an inward movement of the stamens that coats them with pollen. Insects that feed on the foliage of Berberis spp. (Barberries) include Liosomaphis berberidis (Barberry Aphid) and the caterpillars of the moth Coryphista meadii (Barberry Looper). The Ruffed Grouse, Ring-Necked Pheasant, Wild Turkey, and possibly other birds eat the berries; this helps to spread the seeds into new areas. The toxic foliage and thorny twigs are not eaten by White-Tailed Deer. Consequently, when these animals become common in a woodland area, this shrub tends to increase in abundance. Sometimes birds build their nests in this thorny shrub as it provides good cover and protection from predators. Photographic Location: Along a path in an upland woodland in McLean County, Illinois. Comments: Three Berberis spp. 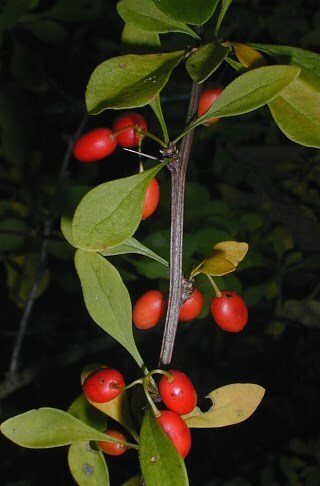 (Barberries) can be found in natural areas of Illinois: Berberis thunbergii (Japanese Barberry), Berberis vulgaris (European Barberry), and Berberis canadensis (American Barberry). Among these three species, only Japanese Barberry has leaves with smooth margins; the other species have leaves with toothed margins. Japanese Barberry has individual thorns along its branches, while the thorns of European Barberry and American Barberry are more often branched, producing 1-3 thorns in a cluster. The only native species, American Barberry, is very rare in Illinois; it is more common in the Appalachian mountains.